ALL EXAMS is an initiative of Unique TutorArc Pvt. Ltd. which is an ISO 9001:2008 Certified software development company. We are a Delhi based company established in 2010. We are comprised of dedicated individuals that have professional experience in a wide variety of industry including teaching, e-commerce, manufacturing, retail, examination, social services, manufacturing, finance, other business. They have come together to develop and distribute powerful software, web solution, SEO that meet the unique needs of today's busy environment. When you wish to prepare for any competitive examination held in India just, simply knock the doors of "ALL EXAMS". We are one of the largest & finest online test series service provider company based in India, offering you diversified practice tests, mock tests and test packages. Unique TutorArc Pvt. Ltd. was founded with the single mission of delivering high quality educational portal services to the worldwide customers. We are a state of the art futuristic company providing educational portal services by integrating people, processes and technology, to focus on the customers. TutorArc brings together the best in people, process and technology to ensure delivery of the highest quality services. ALL EXAMS offers online practice tests and mock tests services to customers 24 hours a day, 7 days a week, and 365 days a year. We add value to customer-contact at every stage of relationship from request to delivery. The success of ALL EXAMS is the amalgamation of cost-effectiveness, customer satisfaction & our belief to serve people in the best possible way. We are open to all kind of education related requests, answer queries, arrange service calls, follow up, and provide optimum customer experience. We ensure to deliver superior quality service along with positive competition preparation experiences in an ethical & dynamic way. Unique TutorArc Pvt. Ltd. exists to understand the impact of digitization in education needs of the students & provide them the best-in-class test series services. We see ourselves as a strategic brand rather than a vendor. We engage with student to establish and maintain long-term and high touch relationships. Well before services are provided, we go to great lengths to understand our student preference & priorities. We customize our business to fit yours. We are flexible, responsive and easy to do business with. As a brand, ALL EXAMS is essentially a one stop shop for all your examination preparation needs. ALL EXAMS takes the responsibility to help you crack entrance examination and get a seat in college as well as help you to get a govt. job by arranging the best questions, technology and servives at the most resonable price. We constantly innovate to enhance our question bank and android application to offer greater value at every step of our service. Considering your exam needs, ALL EXAMS ensures to meet or exceed every single expectation of yours. From your free practice tests to free practice mock tests with solution of wrong ansers, we assure you a life time experience. Besides this, we even render services related to part time job from home to promote as as our business partner. 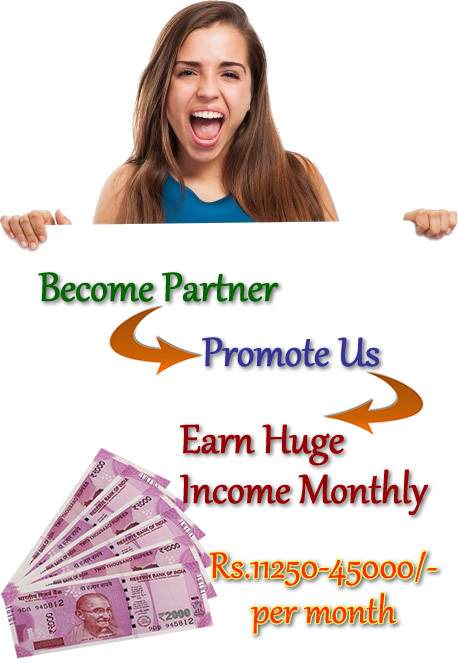 We are offering exclusive partnership programmme for all ambitious and dedicated person who are inetersted to work for themselves in part their part time from the comfort of their home or anywhere in the world. Each partner gets an opportunity to earn by the means of online branding & creating awareness of earning opportunities of the organization. Every successful enrolment with our organization will result in earning for the participant. The daily time investment required will be 1-2 hrs. The earning opportunity for each participant generally varies between 11,250 and 45,000 per month. The participants will have complete flexibility to work from home. The will not involve any target and also there will be no reporting to anyone which means that each one of them can easily manage their time to the fullest.